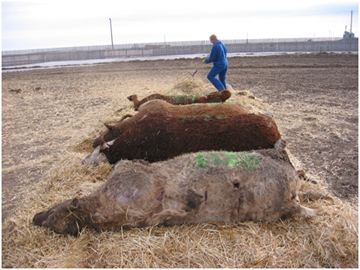 Disposal of cattle mortalities needs to be done soon after death to prevent the spread of disease, prevent contamination of air or ground water, and to help reduce the chance of predation. There are many methods to dispose of deadstock, each with pros and cons. Join this free webinar to learn more about deadstock disposal, including composting, burial, and incineration. Register anyway! This webinar will be recorded and all registrants will be emailed a link to the recording. Registrants will also receive links to additional learning resources. By attending the live event, you’ll have the opportunity to interact and ask questions too. Dr. Kim Stanford was raised on her family farm in the hills of Spring Coulee, Alberta. She has been employed with Alberta Agriculture and Forestry since 1990 and has been a senior research scientist since 2009. Her work with mortality composting started first with sheep and then moved to cattle after the advent of BSE. Her previous studies led to approving mortality composting for livestock mortality disposal within the province of Alberta. Besides composting, she is currently studying on-farm control and characterization of pathogenic E. coli and binders to reduce the availability of ergot alkaloids and other mycotoxins in feed. Dr. Mark Boyce is a world leader in wildlife ecology and conservation biology. His career has taken him around the world, from the US to New Zealand and India to Canada. Presently, he holds the Alberta Conservation Association (ACA) Chair in Fisheries and Wildlife—the longest-running position of its kind in the Department of Biological Sciences. At its core, Dr. Boyce’s work is based on the premise that humans can coexist with wildlife and that it makes our lives better. His cross-disciplinary outlook spans from fundamental science to policymaking on a global scale. This entry was posted in Animal Health and Welfare, Environment and tagged Deadstock, disposal, Kim Stanford Ph.D., Mark Boyce PhD, predation, Webinar by Beef Research2. Bookmark the permalink.